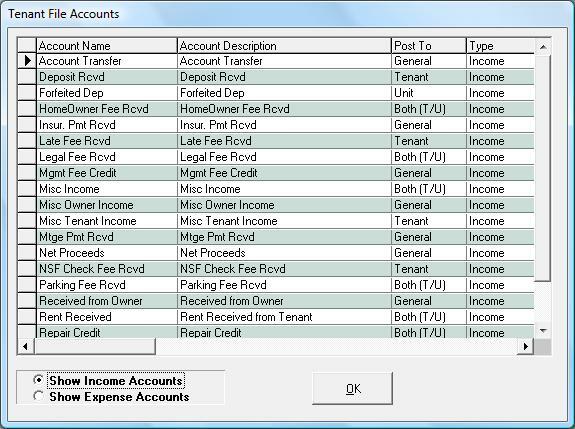 The Tenant File allows you to set up any Chart of Account item you want! Have you or someone in your office ever posted a debit or credit in the wrong line in your accounting software? Have you ever spent ten minutes trying to find the correct account because you had to try to keep track of dozens of account numbers? Well, Tenant File software can ensure that will never happen again. Somewhere along the line it seems that someone decided that it was more efficient to assign each account item a seemingly random number, rather than just calling it by a simple name. The Tenant File software allows you to set up your account items any way that you’d like. You can implement any type of account numbers that you want or you can simply give each a simple name, such as Rents Collected, Management Fees Assessed, or Deposit Received. We know that everyone has their own way of doing business, and we don’t want you to have to relearn an entire system just to use the Tenant File software. Instead, we have created our software to be customizable, so that you can set up your accounts in a way that makes sense for you. With no account numbering system to learn, there will be fewer inputting mistakes. There are no limits to the number of accounting items you can include with the Tenant File software. You won’t have to change your accounting system. If your current system works for you, then you can keep using the same method with our software. Simply edit the names of the accounts upon installation. Our rental property software with automatic management fee posting will help you to run your property management office more efficiently, and with fewer mistakes. Call us, today, to learn how the Tenant File software can meet the needs of your business, while freeing up some of your valuable time to help your business grow.